The UEC European MTB Masters EM 2016 will take place in Bad Goisern at the Salzkammergut Trophy! 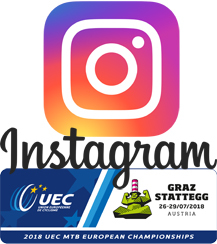 The UEC Mountainbike Marathon Masters European Championships 2014 (again in 2016) took place at the legendary Salzkammergut Trophy and returns on the 16th of August 2015 to its "place of birth" Graz/Stattegg! 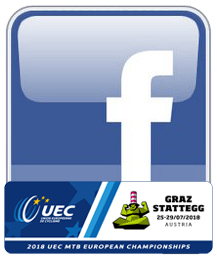 >> The Online-registration for the UEC Mountain Bike Marathon Masters European Championships 2015 in Graz/Stattegg will be opened soon! The "Mountain Masters of Europe” contain riders at the age of 30 or elder (1985 or older) from all over Europe. The UEC MTB Marathon Masters European Championships call riders to challenge on trails from Schöckl and Rannach for the tenth time. The Masters European Championships titles are awarded in 7 male and 3 female classes divided by age. The blue colored tricot and the national anthem award each winner from every listed class to a European Master. Same classification for amateurs and UCI licensed riders. Riders without any license have to close an assurance for foreign nationals. Assurances are available at the race office (€ 8.-). Classification by age in 7 male groups and 3 female groups. 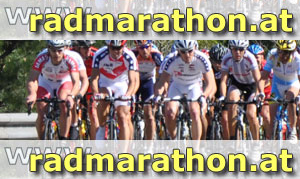 All European riders aged 30 or above (born in 1985 or earlier) who hold a license (Masters, Elite, and Amateur-category) are allowed to race and challenge in the same classification. Riders without any license have to close an assurance for foreign nationals. Assurances are available at the race office (€ 8.-). Transferring charges must be fully paid by the participants! Every participant gets an exclusive XENOFIT Package. At the official feeding zones bananas, apples, bread and sweets will be offered (varying). Available drinks are XENOFIT Performance Sport Drinks, Red Bull, Coca Cola, non-alcoholic beer and plain water (varying). Support with individual food and beverage is only allowed within marked FEED ZONES. Global Sportservice is taking care of timekeeping measurements. They are using an active transponder system. The costs for hiring the transponder is included in the entry fee and the transponder will be given to you at the race office. Transponders have to be returned after the race, otherwise € 60.-per chip will be charged. All riders arriving at FEED ZONE 5 Finish-Lässerhof (1st time) later than 14:00 have to end their race at this point. These riders will be sort out by race officials. These riders will be given a ranking on the basis of the order of their intermediate time, subsequent to the last placed participant, who has finished the whole race course. The terms for 2013 are fixed! The "Mountain Masters of Europe” contain riders at the age of 30 or elder (1983 or older) from all over Europe. 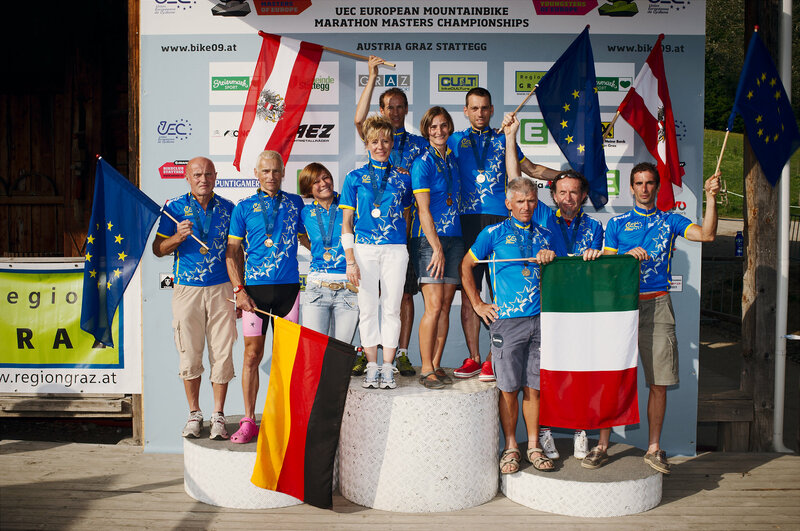 The UEC MTB Marathon Masters European Championships call riders to challenge on trails from Schöckl, Rannach and Plesch for the eights time. The Masters European Championships titles are awarded in 7 male and 3 female classes divided by age. The blue colored tricot and the national anthem award each winner from every listed class to a European Master. 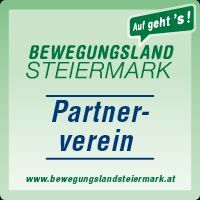 With one Click (or two) to the Online-Registration! >> closed! 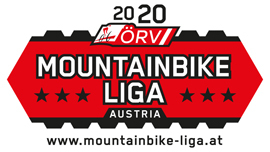 All European riders aged 30 or above (born in 1983 or earlier) who hold a license (Masters, Elite, and Amateur-category) are allowed to race and challenge in the same classification. Riders without any license have to close an assurance for foreign nationals. Assurances are available at the race office (€ 8.-). Every participant gets an exclusive High5 Package. At the official feeding zones bananas, apples, bread and sweets will be offered. Available drinks are High5 Performance Sport Drinks, Coca Cola, non-alcoholic beer and plain water. Support with individual food and beverage is only allowed within marked FEED ZONES. All riders arriving at FEED ZONE 4 Gh. Martinelli/Leber later than 12:45 have to end their race at this point. These riders will be sort out by race officials and can take a 4km shortcut on the public road back to the Start/Finish area. These riders will be given a ranking on the basis of the order of their intermediate time, subsequent to the last placed participant, who has finished the whole race course. Open class - a chance for everybody! The open class race will be held at the official course of the UEC Masters European Championships. Bikers, who aren't allowed to race at the Masters EM (under the age of 30 or Non-Europeans) can take the chance to challenge here. All European riders aged below 30 and all Non-European riders are allowed to race. Classification in 1 male and 1 female group.